TMT Science Advisory Committee (SAC) Meeting on October 12, 2018, at the Thirty Meter Telescope International Observatory project office in Pasadena, CA. TMT SAC members met in Pasadena on October 11 and 12, 2018, to discuss the top-level science requirements for the observatory and its suite of scientific instruments. Two different but very powerful concepts were explored for WFOS: a fiber-based design and a slit-mask design. Extensive studies for both designs were carried out at the conceptual level and evaluated during the past few months. WFOS will be one of the two first-light workhorse instruments for the TMT (the other first-light instrument being IRIS, an AO-corrected near-infrared imaging spectrograph). WFOS will promote advances in many different topics and will serve teams of researchers spanning a broad range of scientific interests. Its most exciting discoveries are likely impossible to predict, but among its many areas of investigations, WFOS will study the distribution and nature of dark matter in the universe, as well as the composition of high-redshift galaxies and the physics of supernovae and gamma-ray burst events. The decision from the TMT SAC to select a more conventional slit-mask concept for its first-light multi-object spectrograph was mainly driven by the desire to emphasize the customizable capabilities of such a design, which can be fine-tuned by each observer for specific science goals. The slit-mask design will provide excellent throughput and imaging over a ~25 sq-arcmin field-of-view. WFOS will now enter its conceptual design phase, with the goal that it will be ready in time for TMT first-light, which is scheduled for late 2020s. The meeting also covered discussions about the next-generations instrument concepts that were submitted to the SAC in response to its call for white papers. (https://www.tmt.org/news/tmt20180418). 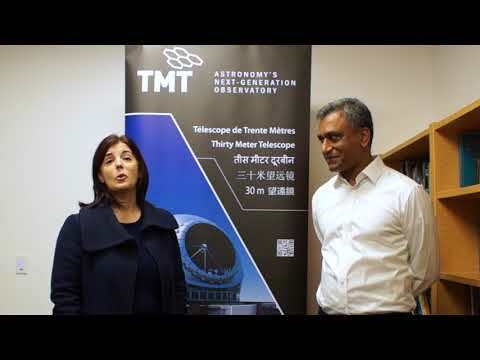 The SAC is composed of representatives of TMT partners and is the primary interface between the scientific community and the telescope projects. The recommendations of the SAC cover progress updates on technical and scientific priorities related to TMT as well as all major TMT programs. To wrap up the meeting, SAC representatives from all TMT partners reported on their respective activities for the project.